American Ninja Warrior, NBC’s obstacle course competition airs tonight with an all new Monday, July 13 season 7 episode 7 called “Venice Finals.” We’ve got your recap down below! On tonight’s episode the top 30 competitors from the Venice Qualifier tackle the Venice Finals course, which includes such obstacles as the Salmon Ladder, Rumbling Dice, Clear Climb and Invisible Ladder. On the last episode American Ninja Warrior the qualifying rounded continue with a very special all-military cast competing on the pier in San Pedro, California in front of the historic battleship USS Iowa. Competitors, including both active duty and retired military members, will tackle the six stage city qualifying course featuring two never-before-seen obstacles – the Log Runner and the challenging I-Beam Cross. Former Army National Guard Caption and six-time “American Ninja Warrior” veteran Ryan Stratis and active Navy Lieutenant Junior Grade Dustin McKinney returned for another shot at the course. This round was the last of the city qualifying rounds before the show headed to the city finals rounds. Did you watch last week’s episode? If you missed it we have a full and detailed recap, right here for you. 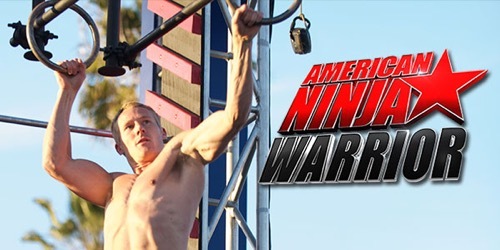 Tonight’s episode of America Ninja Warrior kicks off with the city finals in Venice Beach, California. The road to Vegas begins tonight. Tonight 30 athletes will compete, and only 15 of them will go on to the next round. Tonight’s course is made up of quintuple steps, mini silk slider, the tilting table, spin cycle, hour-glass drop, the warped wall, the salmon ladder, rumbling dice, the clear climb, and the final obstacle – the invisible ladder. First up is 28 year old Rashad Richardson, a motivational speaker. Rashad flies through the quintuple steps, silk slider, tilting tables, and then he struggles on the spin cycle. He manages to recover and get through the spin cycle, but he fails on the hour-glass drop and is out of the competition. Rashad just has to hope that less than 15 athletes complete the course – and he might still have a chance to make it to Vegas. Up next is Ben Melick, a Los Angeles personal trainer and he is wearing his signature Tarzan wrap. Ben flies through the first few obstacles, and masters the spin cycle, he conquers the hourglass drop, flies up the warped wall, the salmon ladder, and the rumbling die get the best of him and falls off the course and is out of the competition. Jason Tirado is the next athlete to attempt the American Ninja Warrior Venice course. Tirado flies through the first few obstacles, and then he drops on the hour-glass challenge. Theo Agu follows in Jason’s footsteps and flies through the first few obstacles, only to get beaten down by the hour-glass challenge. The next competitor to try and master the Venice course is Jackson Meyer. Jackson cruises through quintuple steps, mini silk slider, the tilting table, spin cycle, but like multiple competitors before him he gets caught on the hourglass drop – and is done with the course. Ironically, the hourglass is the same challenge that he failed on last time. Circus performer Almas Meirmanov. Almas flies through the quintuple steps, mini silk slider, the tilting table, spin cycle, hour-glass drop, and the warped wall. Unfortunately, he can’t handle the salmon ladder and he misses the pole and falls in to the water and off the course. Now it is Ryan Robinson’s turn to try and master the Venice city finals course. Ryan moves through the quintuple steps, mini silk slider, the tilting table, spin cycle, hour-glass drop, the warped wall, and the salmon ladder. The rumbling dice gets the best Ryan Robinson and he loses his grip and falls off the course and in to the water. No one has competed the Venice City qualifier course yet tonight, but 36 year old Dustin Rocho hopes to change that. Rocho cruises through quintuple steps, mini silk slider, the tilting table, spin cycle, hour-glass drop, the warped wall, the salmon ladder, and he loses his grip on the rumbling dice and falls down in to the water. He didn’t complete the course, but he is still at the top of the leaderboard so far with the fastest time of the night. It’s time for Jessie Graff to attempt to be the only woman to complete the Venice City qualifier round. Being a professional stunt woman gives Jessie a bit of an edge over the other competitors. Jessie stars the America Ninja Warrior course strong and flies through the quintuple steps, mini silk slider, the tilting table, spin cycle, hour-glass drop, the warped wall, the salmon ladder, rumbling dice. On the 9th obstacle, the clear climb – Jessie’s arms give out and she falls in to the water. She didn’t complete the course, but she made it farther than any of the guys so far tonight and now is at the top of the leaderboard! Gym owner Alan Cannealy is the next competitor to try and complete the Venice America Ninja Warrior course. Alan only weighs in at 115 pounds, but he makes up for that in strength. Alan flies through the quintuple steps, mini silk slider, the tilting table, spin cycle, and then like many of the athletes before him he gets caught up on the hourglass drop and falls in to the water. The odds of him making it through to Vegas are slim. Grant McCartney, who moonlights as a flight attendant when he isn’t training for American Ninja Warrior, is up next. Grant cruises through the quintuple steps, mini silk slider, the tilting table, spin cycle, hour-glass drop, the warped wall, the salmon ladder, rumbling dice, and he makes it all the way to the last rung on the clear climb before he slips and his arms give out and he falls in to the water. Up next is David Campbell, aka “The Godfather,” an American Ninja Warrior veteran and fan favorite. Campbell flies through of quintuple steps, mini silk slider, the tilting table, spin cycle, hour-glass drop, the warped wall, the salmon ladder, rumbling dice, the clear climb, and the final obstacle – the invisible ladder. Campbell makes is almost to the top of the clear climb and he drops from pure exhaustion. He didn’t finish the course, but he made it farther than anyone else has tonight – and has taken the lead at the Venice City finals. Rookie Nicholas Coolidge is up next, he is new on the American Ninja circuit – but everyone remembers him because of his free-spirit approach to life, and because he eats out of dumpsters. Nicholas cruises through the quintuple steps, mini silk slider, the tilting table, spin cycle, hour-glass drop, the warped wall, the salmon ladder, rumbling dice, the clear climb, and the final obstacle – the invisible ladder. Nicholas Coolidge is the first and only person tonight to complete the Venice City qualifier course! The final athlete to compete tonight on America Ninja Warrior is Kevin Bull. Last year Kevin took everyone by surprise when he manages to complete Cannon Alley. Now, Kevin is trying to secure a trip to Vegas. Kevin moves through quintuple steps, mini silk slider, the tilting table, spin cycle, hour-glass drop, the warped wall, the salmon ladder, rumbling dice, the clear climb, and the final obstacle – the invisible ladder. Half way up the invisible ladder, Kevin loses his grip and falls in to the water – literally 2 feet away from finishing the course. All together, the only competitor who was able to complete the course tonight was Nicholas Coolidge, the 15 competitors with the fastest times will be joining him in Vegas for the next round.